Portion taken from Article from Palm Tree of Devorah blog post. Unite, as much as we can, the Whole House of Israel—both Jew and Gentile, made up of the House of Judah and their companions, and the House of Ephraim and their companions—into one Body, and One New Man: New Covenant Israel! But, the term “non-Jew” can be misleading. The majority of the names of people whose stories are included in this book are associated with the Ephraimite Christian movement like Tommy Waller. And this language – “Torah Awakening” – is used on their websites, except they use the word “Christian” rather than non-Jew. Those chosen to be in this book, by and large, remain believers in and followers of the Christian man-god Yeshu despite however many years they’ve been in contact with “Orthodox” Jews. They are supposed to be on a “path”, but they aren’t arriving at the truth. And they are supposed to be “awakening to Torah,” but they remain with eyes firmly closed to the Torah’s truth. We were told in 2006 that Tommy Waller was on this same path that turns out to lead nowhere as today he has not budged an inch from his original Christian faith. Gidon Ariel Partnering with Christine Darg and at the promotion of the book by Rivkah Lambert. When Mike Clayton** speaks of Christians awakening to or embracing Torah, what Jew would imagine that it’s just another veiled reference to the Christian man-god Yeshu? It would be funny if it were not so catastrophic. The Jews think the Christians are awakening to the Torah while the Christians think this new openness on the part of religious Jews signals their awakening to Yeshu, God forbid! Two thousand years ago, the Maccabees fought a 25-year war to eradicate Hellenism from our land. It wasn’t long before the Greek Hellenism was replaced by the Roman Christianity as the next attempt to assimilate Jews into extinction. We should be aware of the fact that Orthodox Jews do expect Mashiach (Messiah) to regather the twelve tribes. Perhaps it could be pointed out to them that the descendants of the tribes are indeed being regathered from among the Gentile nations as they come to Yeshua and into the Messianic Community. And if they are persuaded that many of these “Messianic Gentiles” are really descendants of the ten northern tribes and are awakening to their Israelite identity because of their faith in Yeshua of Nazareth, then they might also be persuaded to consider His Messianic claims more seriously than they did in the past, when they viewed Christianity as just another pagan religion. So, this “phenomenon” which Rivkah Lambert is so eager to connect Jews with is just another Christian ploy to bring Jews and Christians together into one people under Yeshu. How unfortunate that she also has the cooperation and apparent approval of some high profile Jewish names to back her up. The back cover of the book lists Rabbi Tovia Singer as a contributor and prominently includes an apparent haskamah with a brachah for the book’s success by Rabbi Alon Anava. Despite the bold display of the prophetic quote on its front cover (Zech 8:23) ……there is no way the pure words of this prophecy describe the idolatrous Christian connivers featured in the book’s pages. 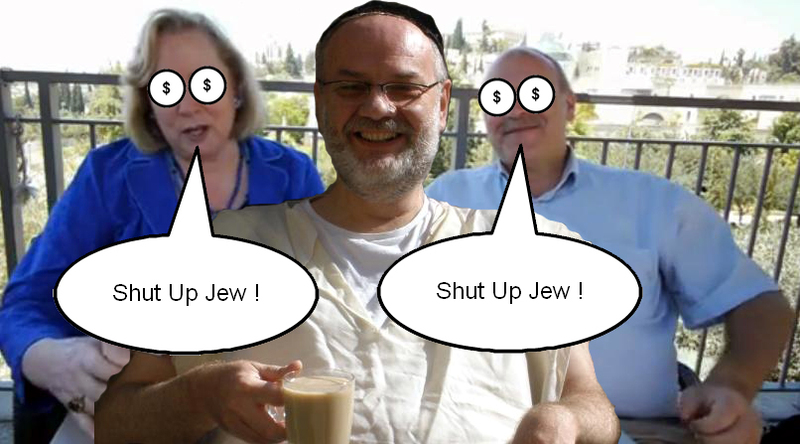 I pray with all my heart that these misguided Jews will awaken (and soon!) to the error of their ways. As for the rest of Am Yisrael – be aware, be informed, keep your distance and warn others. * New Covenant Israel is a fellowship of believers, both Jew and Gentile, who embrace the love and mercy of YHWH and desire to abide in His New Covenant. We understand that Yeshua regained the dominion of Earth from Satan to re-establish the Kingdom of God on this planet, and that Yeshua passed that dominion on to the New Covenant Believers. ** Clayton was a part of the Hayovel harvesting team in 2012-2013 and regularly lectures to Hayovel participants and at messianic congregations. The crazed loon department of Christianity has started up again. Previous nonsense WRT the blood moons and general spooky stuff click here and here. 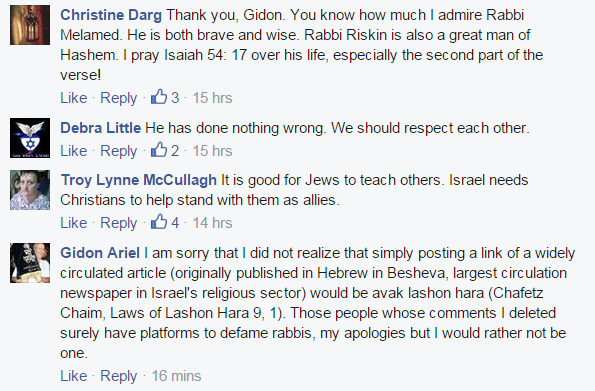 Part of the irony of these references is that this year, September 23, 2015 is the Jewish Day of Atonement. Moreover, the blood moon tetrad has been happening on all the Jewish feasts the last 3 moons, and will fall again on 9/28/15. 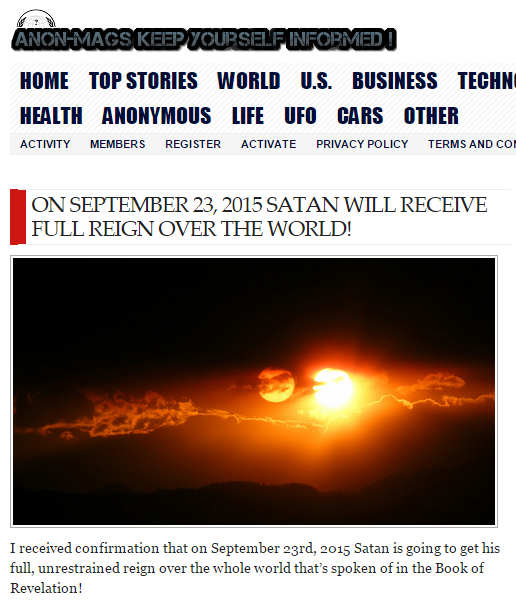 The implication is that it is possible God’s wrath will be poured out on the entire earth, starting on the 23rd of September by allowing Satan to have full, unrestrained rule upon the earth (see Revelation 12:12) upon those who have not received Jesus as the atonement for their sins. In essence, those who reject Jesus will have to pay the atonement fee themselves, and that means wrath. 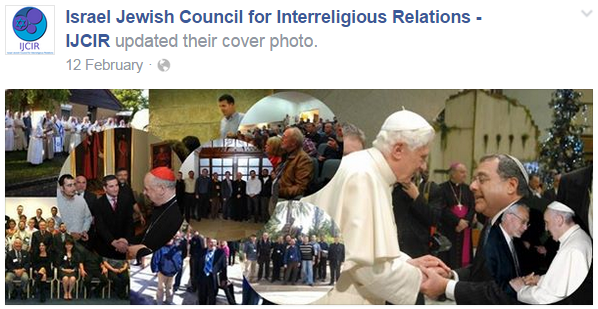 A relationship akin to sleeping with the enemies of the Jewish people is already operating here in Israel. The relationship includes a collusion between Jewish organizations who supposedly support Jews in Israel and the whole missionary industry which covers a wide spectrum of various brands of Christianity. An ongoing unholy alliance between Roman Catholics, Evangelical Protestant groups and the so-called ‘Messianic Judaism” they support is presently becoming more brazen in its efforts to convert Jews to Christianity. The collusion sees a huge chunk of cash being proffered to the money/ power/ prestige hungry leaders of certain Jewish Organizations all under the guise of mutual respect, support of Israel and love of the Jewish people. Any attempt to address concerns is immediately branded by the recipients of the huge chunk of cash as promoters of Loshon Hara. But the question still remains. When will we Jews, our politicians, rabbis, business and community leaders snap out of their hallucinations that this relationship, as we ourselves have allowed it to unfold, is anything but poison to our people and country? The recipients use every means at their disposal to quash any concerns raised about the cash cow they are currently drawings huge sums of money from, after all its not easy living here in Israel! Rabbi Melamed supports Rabbi Riskin and discusses debatable details of the video without a broader enquiry. The broader enquiry would ask why in the world would an organization founded and directed by the Chief Rabbi of Efrat, Shlomo Riskin, and staffed by Orthodox Jews enter into the church-building business? Surely it is not a mitzvah incumbent upon the Jewish people to facilitate the spreading of the gospel of jesus christ anywhere in the world, let alone in Israel! But then again, Rabbi Riskin and his rabbinic partners have proclaimed that Christians and Jews jointly share Abraham’s covenant with G-d. Riskin and the CJCUC have also sanctioned everything from Jews engaging in theological dialogue with Christians to Jews entering churches to granting jesus rabbinic “smicha”. 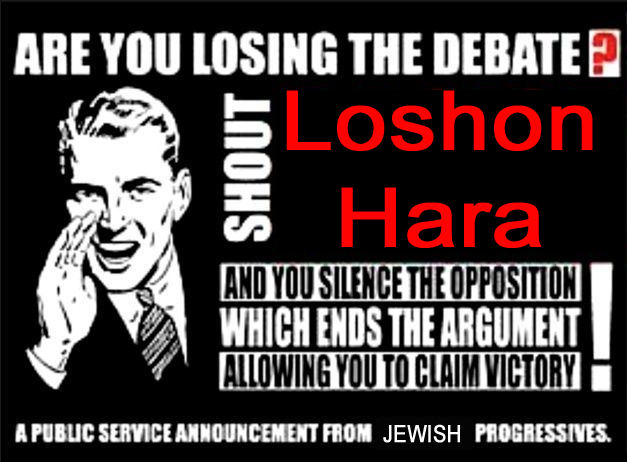 Now at this stage you may hear the cries of Loshon Hara go up to silence the opposition? However, according to the laws of Loshon Hara, JewishIsrael has sought through various channels to meet with Rabbi Eliezer Melamed, the Rabbi of the Har Bracha community in the Shomron, with regard to his halachic and hashkafic pronouncements pertaining to the deployment of Hayovel Ministry volunteers in the fields of Yehuda and Shomron (and now in the Golan Heights as well), a service Rabbi Melamed deems as a “fulfillment of prophecy”. These volunteers are recruited from a number of messianic Christian sects and cults, which are missionary in nature. 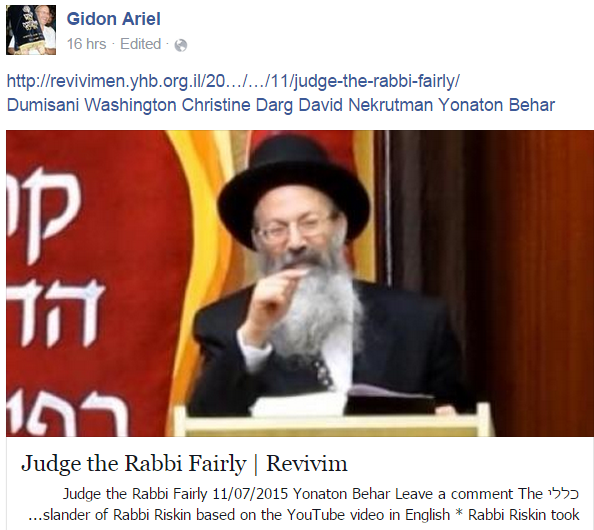 Collusion between Gidon Ariel and evangelical missionary Christine Darg is readliy verifyable on the internet. At the end of the presentation, JewishIsrael staff informed Hermon that they planned to go ahead in the near future with publication of the information presented, and that JewishIsrael hoped Rav Melamed would review the material shortly and respond with his opinion. On Sunday, October 13, 2013, Avraham Hermon conveyed Rav Melamed’s response to the materials they conveyed to him, saying that Rav Melamed retained his position regarding Hayovel Ministries. Ignoring such vital information is part and parcel of the poison that some of the Jewish people have swallowed in subscribing to the doublespeak currently being banded around and accepted on both sides of the Christian / Jewish equation. 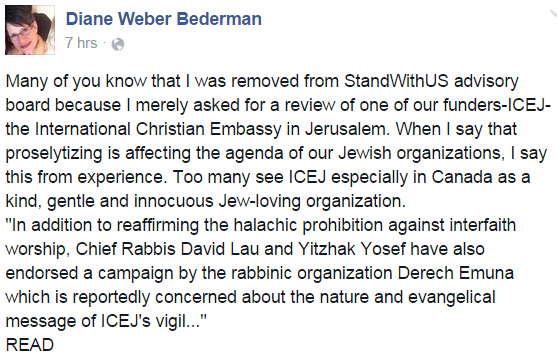 The weird effects of the term follow the money certainly seems to apply with respect to Diane Weber Bederman’s enquiry for a review of one of the funders of the organization StandWithUs; the International Christian Embassy in Jerusalem (ICEJ). The weird effects of trying to follow the money also possibly opens up to the rational inquirer the world of doublespeak. Doublespeak with its love of Jews/ Israel and mutual respect promoted by the likes of StandWithUs, perhaps? Kind of like the doublespeak of the left-wing BBC with their mantra that Islam is a religion of peace contrasted with the reality of bombs going off all over the place and hey presto: a piece of you here and a piece of you there, perhaps? What is really important in the world of doublespeak is the ability to lie, whether knowingly or unconsciously, and to get away with it; and the ability to use lies and choose and shape facts selectively, blocking out those that do not fit an agenda or program. At this stage in the game we see a gaping dissonance between the doublespeak of not proselytizing and in reality aggressively proselytizing by various Christian organisations. Worst still, some of our Jewish leaders choosing to remain silent, which is the same as consenting to the conversion of Jews. Sadly also that some of our Jewish leaders are more than happy to see the spiritual suicide of their fellow Jews for the sake of financial gain. 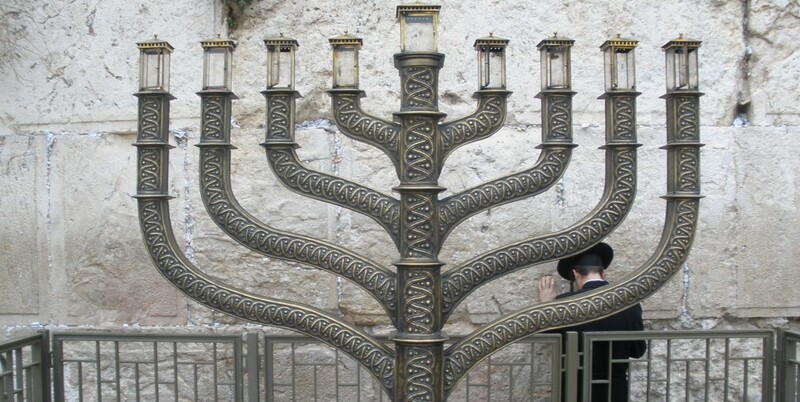 Its time for all Jews to make Havdalah using the correct criteria specified by the clear and widely accepted rulings from modern Torah authorities prohibiting interfaith theological encounters which blur the lines between religious faiths. In other words stop taking the money and do the right thing!! The total solar eclipse will take place over the North Pole on Friday, March 20, coinciding with the beginning of the Hebrew month of Nissan, the first month in the Biblical calendar year. The particular timing of Friday’s solar occurrence has never happened before in human history. The weekend Torah portion read by millions of Jews around the world describes the Tabernacle dedicated on the first of Nissan designed by master craftsman Bezalel. According to Gidon Ariel, Orthodox Jew and co-founder of Root Source, the connection to Friday’s solar eclipse runs even deeper. “The Torah portion describes God choosing the chief architect Bezalel: ‘And Moses said to the Children of Israel, ‘See, God has proclaimed by name Bezalel.’” What’s amazing is that, in Hebrew, the name Bezalel literally means ‘in the shadow of God,’” Ariel told Breaking Israel News. Wake up and smell the $tarbuck$ folks!! Now this is where they tell Menashe to shut up. The problem is that this week’s parsha coinciding with 20 March 2015 is Parshat Vayikra which does not have a mention of Bezalel, in fact the whole of Leviticus (Vayikra) does not have a mention of Bezalel either! It was in fact last week’s parsha which included mention of Bezalel. Christians currently being confused by the superstitious mumbo jumbo which relegates the Torah to the level of a pack of Tarot cards are blissfully unaware that several ways of reading the Torah have been utilized by Jews in centuries past! Included in the several ways of reading the Torah was to read the entire Torah over a 3 year period. Now how about that? How is that going to be abused by Christians and those who erroneously encourage them for the sake of a profit? Ariel believes that the Christian fascination with the Blood Moons is particularly instructive and a lesson God is using to teach the Jews. Well profit Gidon Ariel our book and even the Christian New Testament says otherwise. The fly in the ointment or the elephant in the room is that even the New Testament actually discredits and disproves[see Rev 6:12-13, Mat 24:29] missionary celebrities’ claims about blood moons. Even Christians with lesser bulging waistlines and/ or multi-million dollar budgets are not blind to the nonsense that plops out of the organs of the missionary celebrities’ agenda to love and ble$$ Israel. Scientifically during a blood moon or lunar eclipse, the earth’s atmosphere scatters out shorter-wavelength light (green through violet) leaving mostly longer-wavelength light (red, orange, and yellow) in the earth’s umbra. This is why sunsets and sunrises generally are red, and why most lunar eclipses ‘blood moons’ are red. Mark Blitz and John Hagee use the term Blood Moon to apply to the full moons of a ‘very rare’ ongoing tetrad – four successive total lunar eclipses, with no partial lunar eclipses in between, each of which is separated from the other by six lunar months (six full moons) which began on the night of April 14-15, 2014 followed by next Blood Moon eclipse of October 7-8, 2014. In attempt to hype things up and increase book sales thereby, Darg, Ariel, Hagee and Blitz ignore that lunar eclipses are not that unusual or ‘rare’; there are in fact 39 lunar eclipses in the twentieth century that coincide with Passover or Sukkot which is approximately one-sixth (39/230) of the twentieth-century lunar eclipses. In sum the most glaring omission of Hagee and Blitz and now with profits Ariel and Darg is that the blood moons of the Jewish Scriptures, in the context of the approaching day of the Lord are accompanied by earthquakes, the sun, moon and stars becoming dark. That nothing like this has happened so far means that the blood moons (lunar eclipses) we presently experience are part and parcel of the predictable and observable pattern of the effects of natural movements of the sun, moon and the earth. Given that the eclipses of April 14-15, 2014 and October 7-8, 2014 have already passed without incident and that the solar eclipse does not match up with the current parsha of Vayikra, what else needs to be said?